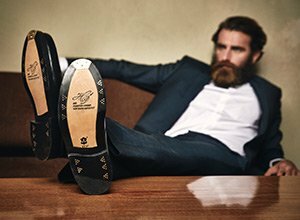 L et our collection introduce you to the elegance and charm of Goodyear-welted shoes. From classics like the Oxford and Derby, to extravagant designs and distinctive exotic looks, to lightweight, comfortable models and practical boots, we offer men’s shoes to suit every taste and occasion. These selected models have been made using an extra-wide last—perfect for gentlemen whose feet are broad at the front. Lively designs, premium materials, and lovingly detailed construction make these traditional slip-on shoes the perfect footwear for the modern city-dwelling gentleman. D o you favour lightweight footwear? Are you on the hunt for the perfect leisure shoe? If so, you will love the models in our “Italian Line”. Blake-stitched and 100% made In Italy, our light and comfortable loafers, boat shoes, and moccasins impress with stylish designs.